My generation (at least in my experience) is in a place where the desire to know the stories of our families is intensified. I have found myself in a place where I want to know more about my parents’ childhoods and how their marriage was before I was born. I want to know about my grandparents and the stories they told my parents. It’s from a desire to know history through the context of life events. Also, I am beginning to process and reflect on my own life stories. Anywhere from campfires to Sunday Schools to the pulpit and families, stories and oral traditions are essential to the continuation of the Christian faith. The problem I see building in our society is the slow breakdown of storytelling as an art. In this age of instant information, we think that we know how things were and sometimes don’t have the desire to know the personal reactions of our families or friends. Also, with the way we are all distracted by the different mediums of entertainment and over packed schedules, it’s hard to devote time to relating our experiences to others. 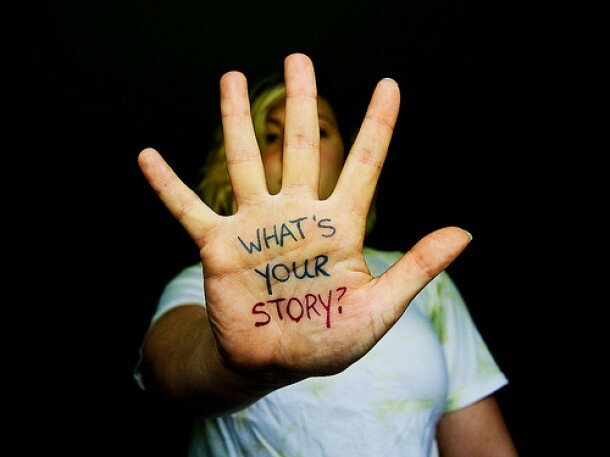 But stories are the natural way we communicate how we experience the world and our lives as a whole. The events that make up our lives are not necessarily a series of events that can be told consecutively, but our minds are wired to turn those events into stories, no matter if they are related or not. The beginning of Christianity relied on stories that were passed down from generation to generation before the Bible became available to the masses. The general population, beginning with early Christians meeting in communities to the churches of the Reformation relied on the leader relating their knowledge of the gospels to their congregations. Today, we still relate the gospel in story form to children and youth in Sunday Schools, but where are the stories in adult formation? If we forget as adults that the gospel is a collection of stories documented from an oral tradition of early Christians, then I believe the emotional response to our readings is threatened. Don’t get me wrong, I am not proposing that the gospels are fictional, but they are written in a narrative form. An emotional response to the parables and events told of in the gospels allows us to empathically experience Jesus’s life and work and to seek to emulate his life in this world. I think the best way to revive the oral traditions of the gospels is through processing with others. For example, processing church services afterwards in a family setting not only reminds the family of what the readings were and the sermon was, but also allows parents to tell stories of how the readings affect the way they live and stories about their lives where they have encountered similar situations. It’s kind of like family sermons, but not as structured. The whole family can talk about what the readings mean to them and everyone benefits from the insights that arise because of that. Also those who are not parents and those without partners can benefit by reflecting together as a couple or by themselves through friends or writing in a journal. There are some churches that have testimonies of faith as part of their services. These can be powerful opportunities and I believe that format should be used in the home. It’s important to pass down the way we came to believe, even if the story begins with being a cradle born Christian. Whether these stories belong in a church service or not is up for grabs, but it’s an important practice even if we realize those stories ourselves. Allowing ourselves to know and think about why we are Christians deepens our ability to relate to our faith and the gospels. We need stories. We need the time set aside to process for ourselves and share with others how alive the gospels really are. We need to know where our faith comes from. We need to know the history of the Christian faith. But most importantly, through all of this we realize that we all fit in the grand story of God’s creation and know that we are loved.